The midge flies are tiny and range from a larval stage which is not much more than some color on the curved shank of the hook to the dry midge on the surface. Although some midges in other areas are larger, the local size ranges from #20 to #28. We have some specially tied smaller sizes down to #32. 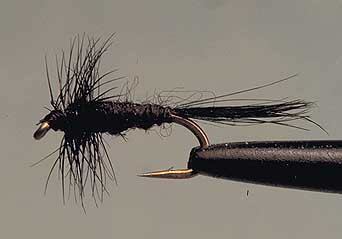 Some older eyes require a midge threader to be able to thread the line through the eye of the hook. As we discussed above, the midge larva will change color from the red to the darker colors be they grey, dark olive or black. So we recommend that one carries a range of colors from size #20 through to #26 or #28 if your eyes can stand it. These are 3 examples of midge flies provided by Umpqua which we carry in the shop. We have hundreds. We have an extensive listing and pictures of our midge patterns dries, emergers, larvae and beadheads in our Fly Index.